Oh, my! The solution is, of course, Diogenes! He was first Aristotle's personal friend, then later a student and Aristotle's personal assistant at the Lyceum http://en.wikipedia.org/wiki/Lyceum_(Classical) [nofollow]. Later, after Aristotle's death he acceded to control (chairmanship?) of the Lyceum, according to provisions in Aristotle's will. Some of his other students thought that they were more in line for the Job. The Lyceum was home to Aristotle's Peripatetic School http://en.wikipedia.org/wiki/Peripatetic_school [nofollow] (he walked all over the place while lecturing, and his students had to follow him at a fast walk like a mob to hear what he was saying) of philosophy. Theophrastus then presided over The Lyceum for about 36 years. In any case, they were close personal friends as well. Although they composed their own works, much of their research was collaborative. One notable example is their measurement of the circumference of the earth. Climbing mountains and taking observations and measurements, using non-decimal, non-algebraic trigonometry they came up with a (maybe - there is some issue about the value of the units used: stadia) twice as large estimate of the Earth's circumference. Not too bad IMHO. Theophrastus is considered by some to be the father of Botany, and his ten volume (of which 9 volumes survive intact) collection entitled On Plants http://en.wikipedia.org/wiki/Historia_Plantarum [nofollow], describes observed plants and attempts to catagorise them into groups according to properties (e.g. leafy, produces nuts, produces gum, etc). He also wrote an eight (of which six survive) volume treatise On the Causes of Plants. These works were essentially empirical (and IMHO quite modern) in nature. He was an extremely apt observer of the natural world after Aristotles nature, and although there was much overlap, Theophrastus interests also struck out in many original directions. He had an extraordinary output of published writings on an extremely broad range of topics. The quantity and scope of his interests and publications would seem enormous by any standard, except perhaps as overshadowed by the even greater output of Aristotle. Unlike Aristotle, however, his written works are not so artfully written. Some of theme seem to be more outlines or lecture notes on a given subject than a narrative text. Aristotle had a brief professional association with a young Alexander the Great (as his tutor). When the Romans 'liberated' Athens, some years later, the anti-Macedonian sentiment got quite strong and Aristotle and Theophrastus headed back to Theo's home of Lesbos for a while and that is where they did much of their work on animals and plants respectively. They eventually returned to Athens several years later and resumed their respective careers. Geezer, I am sure you got this, but for clarity's sake the (anachronistic)reference to Bass and JimBob is to two denizens of a particular other subboard here on NS. They are geologists (and a pair of real characters... I think I can say without serious fear of contradiction) and would have good cause to take issue with the use of the term 'stones' - at least if it were used that way today. At the time, the distinction between rock and mineral was not particularly defined. He wrote an empirical book 'On Stones' grouping various rocks and minerals by appearance, behavior, and other observable properties. He is also author of a book 'Characters' on observed human behavior, also attempting to organize things by groups. His other output is varied and comprises subjects both scientific and humanistic. There are writings on ethics, physics, politics, education and many other things. There does seem to be a common current of observation and recording, even if the data does not always lead to a specific conclusion in the more naturalistic studies. An interesting and accomplished individual. @damocles: My namesake (Diogenes of Sinope, the Cynic Philosopher (flourished ca.4c BC) http://en.wikipedia.org/wiki/Diogenes_of_Sinope [nofollow] as opposed to the somewhat similarly named Diogenes Laertius, the historian) was certainly an interesting individual, but he was not a scientist. He came from Sinope, a city on the Black Sea (modern Turkish Sinop). His comments and observations were primarily on ethics and matters of human nature, education, behavior and the like. No directly written works (of which there are known to be several) of Diogenes of Sinope survive, and what legacy we have of his comes from quoted fragments and stories. He was a personal friend (frenemy?) of Plato and crashed all of Athens' best parties and generally made a public nuisance of himself. A story describes his own encounter with Alexander the Great that I think is highly amusing and instructive although it is not really relevant to this forum, but highly worth looking up. Hope this was entertaining and instructive. And to DiogenesNY for a great puzzle. Ain't Google a wonderful thing! I had never heard of the guy before this. I was not a scientist, though I was closely connected with scientists. I was quite famous in my own right, and greatly accomplished in several areas. When receiving a major award, I commented that five of my closest relatives had all received Nobel prizes, but not me. I died sometime in the last decade, at the age of 102. Not much activity here! Clue: the Nobel prizes were, in order, physics, physics, chemistry, chemistry, chemistry, and peace (and yes, that is 6 of them). Just to shorten the list. Is the person on this page? No, the person is not on that list. S/he was not a scientist, but 4 of the closest relatives were. World standard achievements in 3 fields, but best known in connection with UNICEF. Sorry - had missed this thread was active again. That's an easy one Damocles - 6 Nobel prizes, 5 members of same family - has to be the Curies. Marie, Pierre , Irine and her husband Frederick Joiliot-Curie and the other in-law Henry Laboussie. Henry's wife was the other sibling Eve - she was the only one of the Cuire family who did not win a Nobel! She was not a scientist - although with a family like that you will not be surprised to know she was quite something! And that, of course, is quite right Imatfaal. Clearly almost nobody is checking this forum. Ok, so a quick web search will give an answer. Nonetheless... an interesting phrase. That was Albert Einstein, checking with his boss when a questionable application came in. An appropriate item after the last CliffordK, actually, because the Curies steadfastly refused to patent anything arising out of their work on radioactivity. I got the general field and the rough timing right, but not the specifics, before doing my "quick web search". This thread seems strangely quiet to me; I would have hoped there were a few more forum users interested in providing/solving this sort of puzzle. I greatly enjoy it. So it has been a few days since the thread was paralysed (significant word) by CliffordK's last offering. I will fire up again. Who am I? My career as a leading scientist in my field was marred by an unfortunate misinterpretation of some results in the middle of it. The case had some interesting parallels with the later "cold fusion" story. The work in question was indirectly linked with the name of an American satirist, political commentator, and sci-fi author. More recent than Mark Twain -- 1960s actually. And the American referred to is probably best known outside America as a sci fi author. How medicine has changed from the beginning of the century. 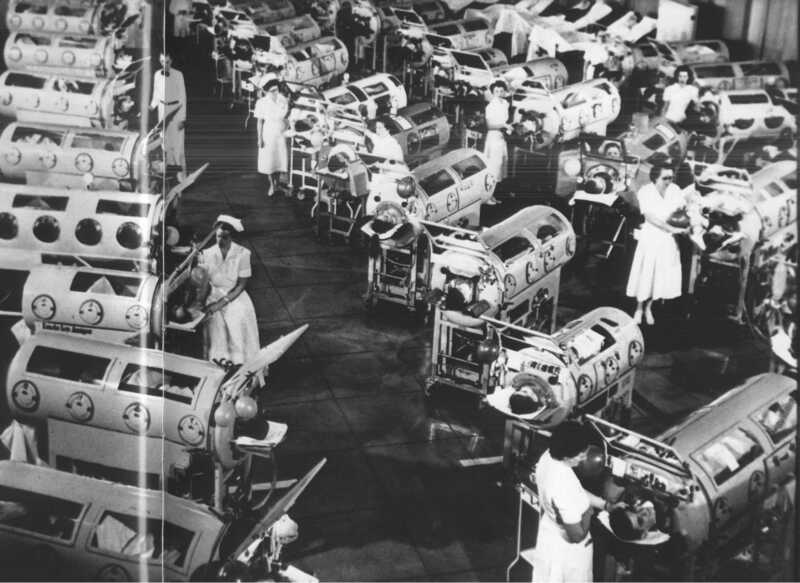 Dr. Jonas Salk's invention of the Polio Vaccine has all but eliminated the need for Iron Lung wards. And, he chose to donate the vaccine to humanity. Polio has now been wiped out of most of the "Western World", with only a few remaining hot spots in 3rd world nations. India has now had no new wild-type polio cases for about 1.5 years, and may have in fact eradicated the disease, thanks to Mr. Salk's vaccine. I believe there are only 3 endemic countries, Afghanistan, Nigeria and Pakistan, and perhaps a few other sporadic cases elsewhere. My first guess would have been Urbain Jean Joseph Le Verrier who found Neptune, then had an unsuccessful search for trans-Neptunian planets, as well as an unsuccessful hunt for Vulcan, an intra-Mercurial planet. Unfortunately, I fear that I'm off in both time and place. Further clue: I worked with materials, and my misadventure involved a very familiar material. Page created in 0.153 seconds with 77 queries.